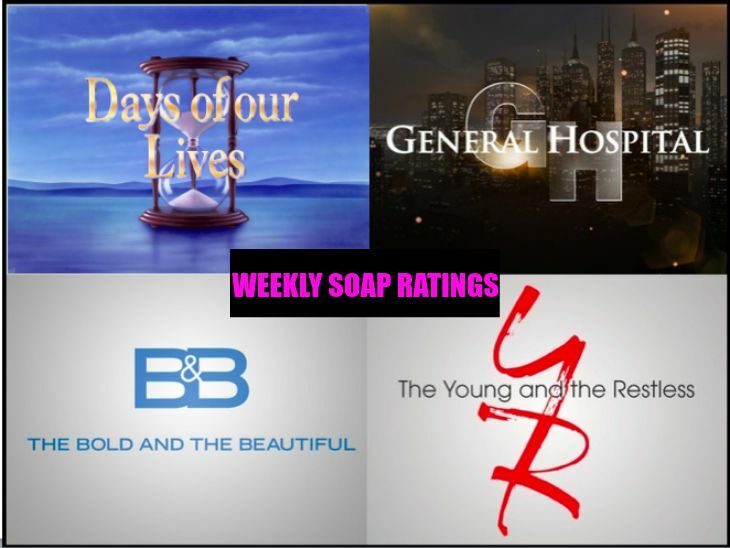 The soap opera ratings for the week of July 25-29 have been posted by Soap Opera Network and while ‘The Young and the Restless’ ratings didn’t drop, the daytime drama’s ratings didn’t go up either. ‘The Bold and the Beautiful,’ ‘General Hospital,’ and ‘Days of Our Lives’ all had ratings increases with total viewers but showed a drop with women 18-49. Total viewers for ‘DOOL’ the week of July 25-29reached 2,188,000,a gain of 28,000 and that is the third straight week the daytime drama has seen for total viewership. ‘DAYS’ did not fare so well with women 18-49 with 351,000 tuned in. That’s a loss of 25,000 viewers in that category over the previous week. ‘GH’ had 2,678,000 total viewers for the week of July 25-29. That represents a gain of 157,000 viewers from the previous week. Women 18-49 tuned out again with 427,000 watching the soap opera. That represents a loss of 26,000 viewers in that demographic. Total viewer ratings were up for ‘B&B’ with 3,676,000 watching the soap opera. That is an increase of 49,000. However, ‘The Bold and the Beautiful’ hit a new low for the second straight week in the women 18-49 demographic. With 476,000 watching the daytime drama lost 1,000 viewers in this category. ‘Y&R’ stood still in the ratings for total viewers with 4,625,000 tuning in. After taking a massive hit in the ratings the week of July 11-15, ‘The Young and the Restless’ bounced back the week of July 18-22 for total viewers and for the week of July 25-29 there is no movement in the ratings at all. Women 18-49 tuned out this past week with 593,000 watching. That’s a loss of 13,000 in this demographic. Please note – ‘Days of Our Lives’ will be preempted from Friday, August 5 through Friday, August 19 for the Summer Olympics in Rio de Janeiro. ‘DOOL’ will return with its new season on Monday, August 22.